Book tee times or packages online with us at Gramacho golf course and get up to 30% discount. 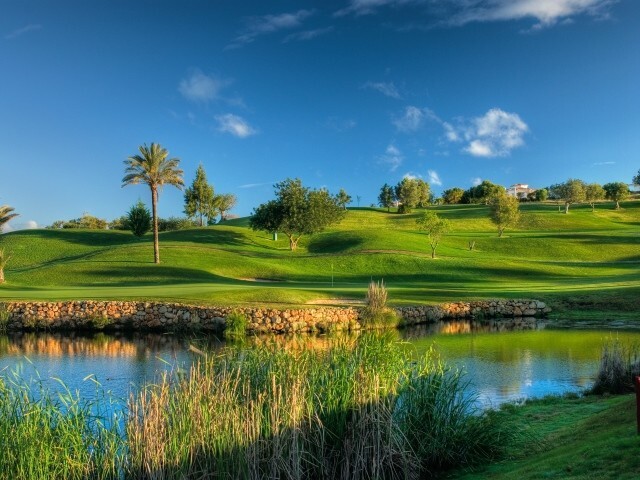 The 18 hole Gramacho Golf Course and Resort which is located inland between the village of Carvoeiro and Lagoa in the Algarve. Originally only a nine hole course opened in 1991, its architect Ronald Fream has cleverly extended it to the 18 holes that it is today. As it is a resort the golf course fairways wind their way between the holiday villas in undulating terrain sprikled with olive and carob trees. Well placed water and bunker hazards add to the challenge so the golfer must play with accuracy and placement in order to end with a good scorecard. All the Par-4 and Par-5 holes are doglegs requiring skilful drives from the tee and the size of the greens seem to be well matched to the length and accuracy of the approach shot. Golfers will find the final five holes tend to be very demanding from the tees to the green and careful play will help to keep the final score down to a decent total. The Gramacho Golf Course should be seriously considered with its sister course the Pinta should be considered for your Golf Holiday Package.